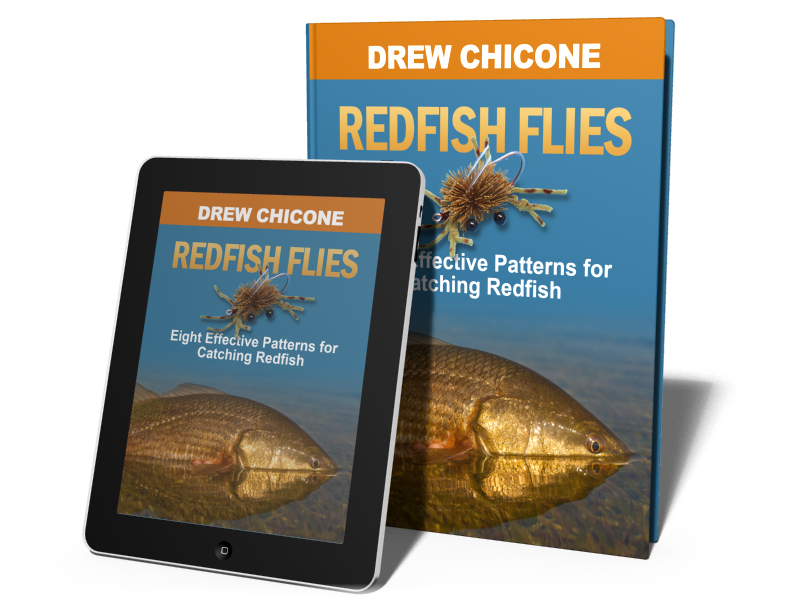 Over the past few weeks I have given you the basics on the 8 proven pattens from my latest book “Redfish Flies”. Simply click on the link or icon above to download the 175 page pdf. of “Redfish Flies“, illustrated with ultra-hi resolution step-by-step instructions for $14.99 or head over to www.saltyflytying.com to order your signed paperback version for $24.99. The eight pattens outlined in Redfish Flies have been fine-tuned and rigorously tested on countless grass flats, oyster bars and mangrove shorelines. Tying and stocking your box with this proven assortment of flies will ensure you have the ammunition need to coax even the most refined redfish, and the insight provided in the interviews of the contributing guides and tying guru’s will help you understand what factors need to be consider to create your own productive redfish flies. Otherwise, read on and I’ll recap all of the material covered in the past post from “Redfish Flies”. Thanks for reading, and if you have questions or other topics in mind you would like explained, feel free to comment or send me an email – drew@saltyflytying.com. Has the pattern evolved or changed any over time (Materials, Tying Techniques etc.)? The fly has remained basically the same over the years as I tie the fly. But like any good pattern, different variations have come along from other tiers. I have seen monofilament threaded through the claws to stiffen them, tailing added making it more of a slider, and many other improvements or changes for specific applications. My only change has been the addition of an orange “egg sac” of Finnish Raccoon around the tailing flash. This is the ninth installment of Redfish Flies. To read the rest of the interview, and for the complete step-by-step instructions for tying this redfish fly and 7 more, download your copy of Redfish Flies at www.saltyflytying.com $14.99 or order your Signed Paperback version today ! $24.99 + Shipping. In your opinion what makes the pattern so effective? In my opinion the fly has remained so effective over the years is that it mimics many different crabs and other crustaceans, is easy to tie, easy to cast and fish, and it produces. This 175 page downloadable pdf. is illustrated with ultra-hi resolution step-by-step instructions, click the link, or icon to download your copy today. $14.99 Or order your signed paperback version at saltyflytying.com $24.99. Detailed instructions for tying Drew Chicone’s Kung Fu Blue Crab, Capt. Ron Ratliff’s Fiddle Sticks Crab, Capt. Daniel Andrews’s Pine Island Ice Tea, Drei Stroman’s Budagrassy Shrimp, Chris Kincaid’s Rump Shaker, Capt. Joe Costadura’s Grass Monkey, Bill Laminack’s Gulf Shrimp, and Don Reed’s Batman pattern. Why did you choose the materials you did and the techniques to apply them? Most of the materials choice was based on trying to achieve the most realistic appearance possible. Applying Epoxy over Monofilament as a base creates the perfect translucent appearance that matches live shrimp quite closely. Applying a little bit of appropriate colored marker over the monofilament bleeds in and creates nice life like blends of colors. The antennae and some of mouth parts are created from Kanekalon or Yak Hair. These materials are readily available, durable and cheap. The original eyes are made from 11/0 Glass Beads from Craft stores and coated in epoxy, much like many other crab and shrimp patterns. The EP Shrimp eyes will work if you do not have the time or materials to create your own. This is the eighth installment of Redfish Flies. To read the rest of the interview, and for the complete step-by-step instructions for tying this redfish fly and 7 more, download your copy of Redfish Flies at www.saltyflytying.com $14.99 or order your Signed Paperback version today ! $24.99 + Shipping. A relatively slow sink rate with a hook riding up allows you to fish the fly over grass flats that are 2′ or more. This allows you to present a very accurate shrimp fly in to the exact places where redfish are looking for shrimp and crabs. The sight of a shrimp popping over the tops of sea grass is just something that few redfish can resist. What factors led you to design the pattern? I’ve always been a spontaneous kind of fly tyer. Sometimes I’ll set out to tie a particular pattern and then come up with an improvised version or one that turns into something completely all it’s own. This particular pattern actually started out as a bend back without the bend or a reverse tie as they’re sometimes called. Because it had bead chain it would sink slightly faster. By adding the deer hair head it actually helps keep the fly exactly in the column of water I want and also adds bulk and body to the fly, which makes it push more water. I believe this draws more strikes especially in a shallow water situation. In the end it became more of a Slider pattern like the Tim Borski Redfish Slider, which has always been one of my favorite Redfish bugs. This is the seventh installment of Redfish Flies. To read the rest of the interview, and for the complete step-by-step instructions for tying this redfish fly and 7 more, download your copy of Redfish Flies at www.saltyflytying.com $14.99 or order your Signed Paperback version today ! $24.99 + Shipping. What conditions/environment/situation was the fly designed to be fished in? Olive craft fur really is just one of those versatile materials which is synonymous with back country fly tying and I’m really no exception when it comes to using it. The deer hair gives the fly a little buoyancy which keeps it just above the grass and in the fish’s line of sight. The Estaz chenille gives the fly body as well as flash, which will also make it stand out if you find yourself in a little dirtier water. And the gold Flashabou is just a little added flavor since its no secret that Redfish like gold (gold spoons, hint hint!). I really wanted this fly to give the impression of a shrimp scooting backwards out of the grass, as if it was fleeing from an approaching predator. The weight of the medium bead chain eyes on the front of the fly and the upraised angle of the craft fur in the tail make this fly move in small bounces when retrieved, just like a shrimp. The craft fur, Arctic fox body hair, and grizzly flutter legs mimic the appearance of the larger legs towards the front of a shrimp’s body and the EP wooly critter brush tapers down to mimic the appearance of the smaller legs towards the tail. 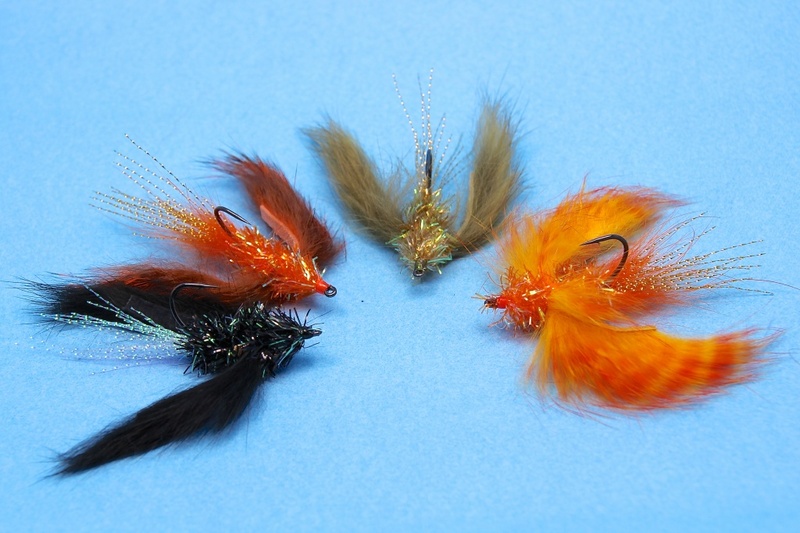 This is the sixth installment of Redfish Flies. To read the rest of the interview, and for the complete step-by-step instructions for tying this redfish fly and 7 more, download your copy of Redfish Flies at www.saltyflytying.com $14.99 or order your Signed Paperback version today ! $24.99 + Shipping. How do you recommend fishing the fly? Most of the time I am sight fishing so I try and get the fly directly in front of the fish, or cast and retrieve it where it would intercept the fish about 1’ in front of its face. Don’t be bashful; this fly makes a fairly stealthy water entry. Watch the redfish’s body language and you will be able to tell when the redfish first spots fly. He will usually do one of two things; charge forward and inhale the fly, or he will begin to follow with curiosity. If you get a fish that is following, try speeding up your retrieve to invoke him to charge and eat. Being that this fly represents a tasty treat, this fly can be fished in all conditions all year. The best conditions will always be clear calm. I also like it when the waters are a little stirred up. 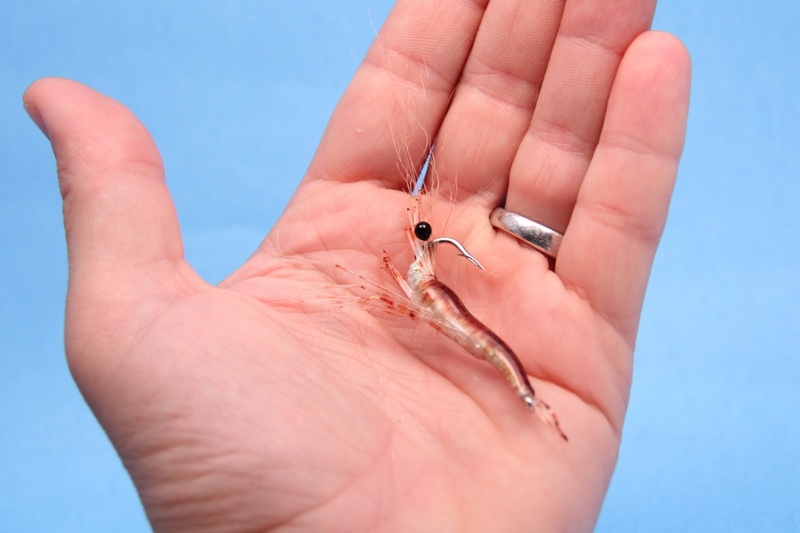 This shrimp can be fished in many ways, with floating, intermediate or sinking lines. This of course will be based on where you are fishing and for what. You know that the best way to use this fly is to first fish it in shallow waters. This way you can get a better understanding of how to work the fly. Grass and sand flats, pot holes, drop-offs, current and of course structure are my favorite way to fish this fly. I find that fishing with a sinking line in the undercuts of banks with a soft tidal change is great for those fish holding there. I really like to fish this fly on an intermediate or sinking line in deep cuts and drop-offs during tidal changes when the current is beginning to flow. This is the fifth installment of Redfish Flies. To read the rest of the interview, and for the complete step-by-step instructions for tying this redfish fly and 7 more, download your copy of Redfish Flies at www.saltyflytying.com $14.99 or order your Signed Paperback version today ! $24.99 + Shipping. No, not by much. The two changes are the hook (based on species being fished) and the addition of hollow tubing to aid the antennae from fouling (optional). I am always looking for a material to replace the main body of the fly…why? I’d like a little tougher material that has a buoyancy factor. This material also needs to be compatible with the glues used for binding the materials together. This will also keep the fly in business longer….ha-ha! I chose the deer because I knew I could easily make the shape of the shell I wanted. The legs are micro chenille, which happened to be the correct thickness I was looking for, and easily shaped and colored if needed. You can use anything from bead chain to lead eyes for the situation you will face. This is the third installment of Redfish Flies. To read the rest of the interview, and for the complete step-by-step instructions for tying this redfish fly and 7 more, download your copy of Redfish Flies at www.saltyflytying.com $14.99 or order your signed Paperback version today $24.99 + Shipping. In your opinion what makes the fly so effective? I believe the shape, size, and realism makes this fly irresistible to a red fish. I have also heard reports that permit have been munching on them. Although there are countless species of crabs that exhibit the estuaries of the gulf coast, the one that is most recognizable and the therefore the one I most frequently try to emulate is the blue crab. It’s vibrant splashes of orange are hard to miss in clear water, and even more difficult for a cruising redfish to pass up. This is the second installment of Redfish Flies. To read the rest of the interview, and for the complete step-by-step instructions for tying this redfish fly and 7 more, download your copy of Redfish Flies at www.saltyflytying.com. 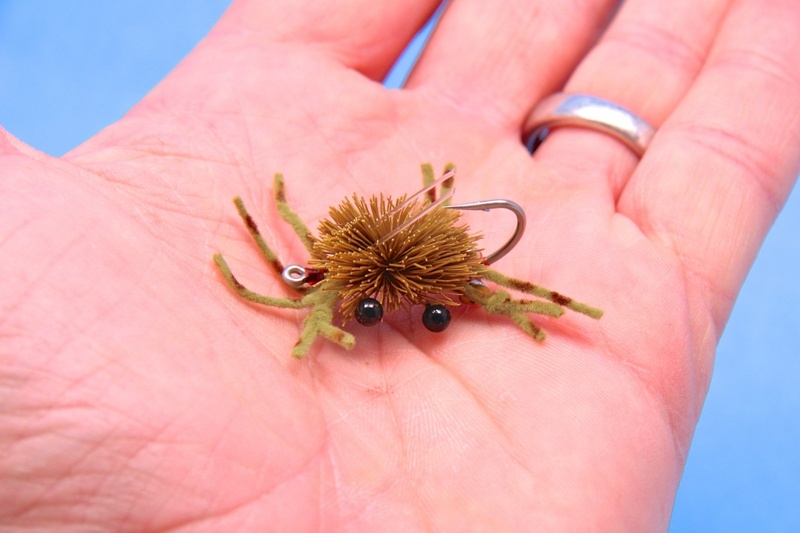 When presenting this fly to redfish, you want the fly to get down in front of the fish quickly. 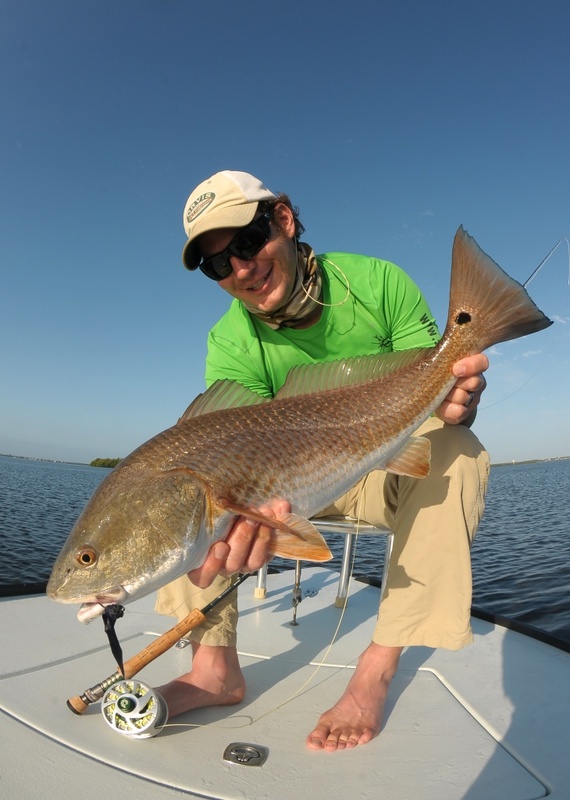 Once you have made your cast to the redfish, creep the fly along the bottom with ultra-slow strips. The fly should look like it barely moves. Once the fish becomes aware of the fly, don’t move it! My Blue Crab variation of Eddie Wyatt’s Kung Fu Crab, is simply a larger and more colorful version of the classic permit pattern. This vibrant version is also tied much bulkier than the original and the legs are left longer for more movement when the fly is not being stripped. This 175 page downloadable pdf. is illustrated with ultra-hi resolution step-by-step instructions, click the link, or icon to download your copy today. $14.99 Paperback version also available at saltyflytying.com. Detailed instructions for tying Drew Chicone’s Kung Fu Blue Crab, Capt. Ron Ratliff’s Fiddle Sticks Crab, Capt. Daniel Andrews’s Pine Island Ice Tea, Drei Stroman’s Budagrassy Shrimp, Chris Kincaid’s Rump Shaker, Capt. Joe Costadura’s Grass Monkey, Bill Laminack’s Gulf Shrimp, and Don Reed’s Batman pattern. Crustaceans, shrimp, crabs, oysters, worms, pinfish, baitfish… dead or alive, it doesn’t really matter, redfish are opportunistic feeders and they eat just about everything. So catching them on fly should be easy right? Not for me… For years redfish were my “White Wale” on fly. Too spooky, near misses, had ’em and lost ’em, terrible tides, you name the excuse I heard it or said it. For the vast majority of us, catching redfish on fly is just not that easy… and tying and designing flies for them, takes a little more than luck and a sharp hook. “Redfish Flies” is loaded to the gills with ultra high resolution photography illustrating how to tie and fish some of todays best redfish patters. Guides and guru’s from Florida to Louisiana and everywhere in between have contributed their go-to redfish bugs. There’s no guess work here, Redfish Flies has elaborate step-by-step instructions for tying these eight proven redfish flies will walk you through the process of creating flies that work. Insightful interviews with each patterns creator will help you understand what conditions the fly is best suited for, and how the fly should be fished. Stunning photos from renowned photographers Pat Ford, Adrian Gray and David McCleaf will awe and inspire you to dust off your vise and get tying! Step-by-step tying instructions for tying the Kung Fu Blue Crab, Fiddle Sticks Crab, Pine Island Ice Tea, Budagrassy Shrimp, Rump Shaker, Grass Monkey,Gulf Shrimp, and the Batman. Eight proven patterns for catching redfish. 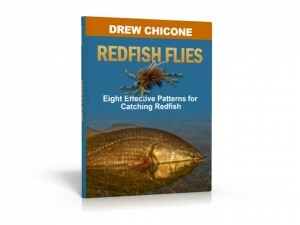 “Redfish Flies” is a 175 page downloadable pdf. illustrated with ultra-hi resolution images. 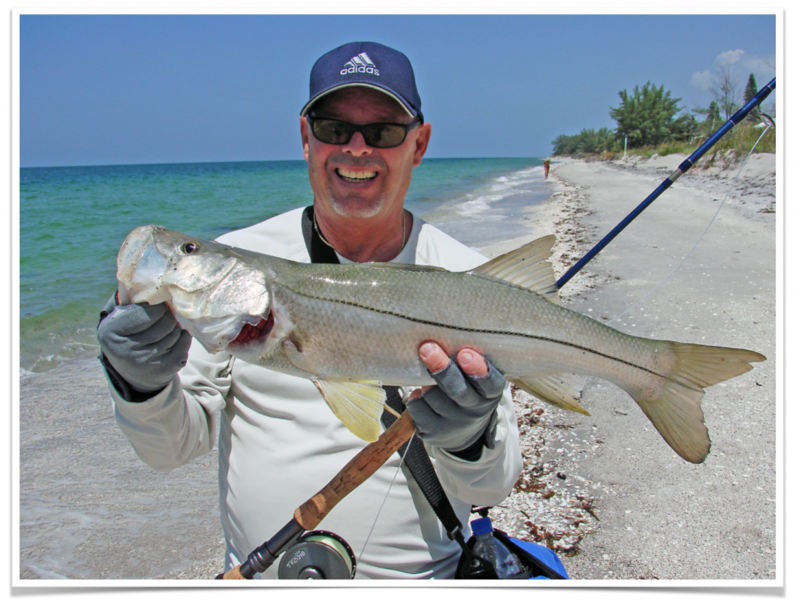 Insights from eight saltwater fly tiers, including Drew Chicone, Capt. Ron Ratliff, Capt. Daniel Andrews, Drei Stroman, Chris Kincaid, Capt. Joe Costadura, Bill Laminack, and Don Reed.